You’ve just come home from the hair salon, and are absolutely in love with your new look. Whether you’ve just treated yourself to hair color or highlights, you want to keep them vibrant and fresh until your next treatment. Kimberly Gore Salon is Columbus, Georgia’s premier hair salon. We specialize in haircuts, color, extensions and locs, bridal hair, and more. To get the most gorgeous-looking hair possible, book an appointment with us today! Here are some tips you should know about keeping your hair color fresh! 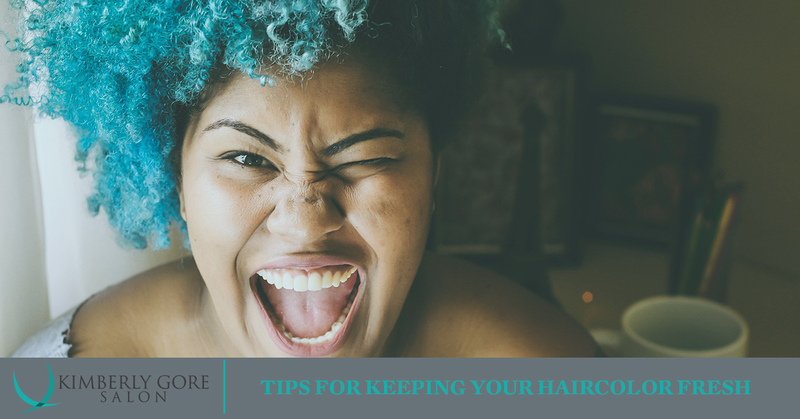 Hot water is the nemesis of colored hair, so if that’s what you’ve been using, it’s time to make a change. Cool water protects your hair color and will help it last longer. Blow dryers and straighteners might be staples in your hair routine, but they could be harming your color. If you’re going to use them, and we’re not saying you shouldn’t, keep a few things in mind. One, use the lowest heat setting you can while accomplishing what you need to. Two, use a product specifically formulated as a thermal protectant. This will prevent damage to your color and your hair shafts. Shampoo and conditioner, even the best brands out there, can strip your hair color and highlights between visits. Washing less often will protect that precious color, especially if you use sulfate- and alcohol-free products. You already protect your skin from the sun, and your hair should receive the same care. Hair color will fade much quicker when exposed to UV rays, whether it’s in a tanning bed or from going outside. There are some products you can get at the hair salon specifically formulated to protect from UV damage–be sure to ask your stylist for recommendations. Wear a hat when you go out, too! Who doesn’t love swimming? While you might really enjoy cooling off or exercising in the pool, the problem is, all that chlorine is going to wreak havoc on your highlights. Chlorine not only fades color, but can turn lighter shades green, and dry out the hair shafts. Dead ends and damaged hair will not only take on a frizzy look, but it won’t show off your hair color in the best possible light, either. Keep your hair looking and feeling healthy by getting it trimmed regularly. To get the best hair color and highlights in Columbus, Georgia, book an appointment at Kimberly Gore hair salon today!